The Belfry at Yarcombe Restaurant & Room Restaurant with RoomsThe Belfry Country Hotel is a wonderful place to unwind and relax. 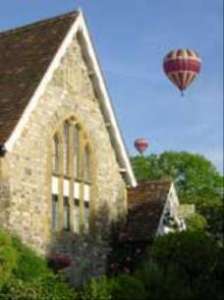 The Grade II listed building is a former school situated in picturesque Yarcombe. The resident owners, and their cats, extend a genuinely warm welcome creating an atmosphere of friendliness and peaceful relaxation. Fine food predominates and guests may begin the day with anything from a slice of toast to a whole side of smoked haddock, full English or the winter specials of oatmeal brulee. Dinner guests choose in advance from the superb menu and their meal will be freshly prepared from the finest local ingredients. The Belfry is fast gaining a reputation for fine dining with both residents and locals alike, as is the splendid wine list. With only 6 individually styled luxury en suite bedrooms The Belfry provides a high standard of accommodation blending traditional features with modern comforts. With guest comfort in mind there are thoughtful additional touches including freshly baked goods, mineral water, luxury bathrobes and top quality towels and linens in every room. Guests are welcome to browse the owners’ collection of books and music to enjoy in the lounge or with each room’s CD player. Surrounded by rolling countryside with stunning views of the Yarty, The Belfry is ideally located to explore the magnificent countryside of England’s south west from the Jurassic World Heritage Coastline to the wide-open spaces of Dartmoor and Exmoor. Please note The Belfry is a non-smoking establishment and does not take children under 13 or pets. Children welcome from age 13. On A30 7 miles east of Honiton and 5 miles west of Chard. One mile south of A303 and 10 miles south of M5 at Taunton jct 25.